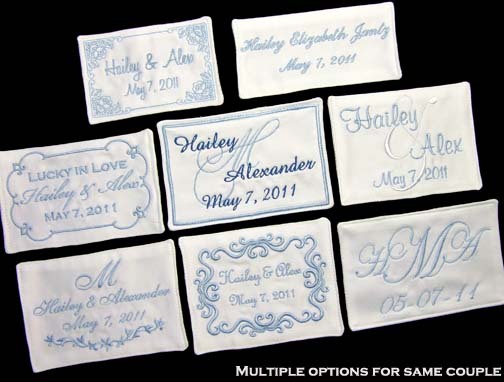 All of the labels on The Gartermaker are custom labels, designed and sewn just for you. But if you are not sure exactly what you are wanting on your label, we have the Full Custom Design label option. With the Full Custom Design label, we take the information you provide, and make up many different options with different fonts, borders, and layouts. We can revise them as needed, and work together to create the perfect label. We will send you a selection of designs to choose from, and then we work back and forth until the design is what you were looking for (even if you didn't know what that was at first). Dress labels range in size from 2-4” tall X 3-5 wide”, but can be a bit larger due to the borders, fonts, and wording chosen. Borders 10-15 tend to be on the larger side, especially if full names and dates are chosen. This label does not include custom digitization of a monogram you already have, unless it is done in fonts that we have, or that are freely available. Please see our other custom label options for that. Please note that this style of label is not available for rush orders, unless approved before order-the design and communication process can be too lenghty for a typical rush order.